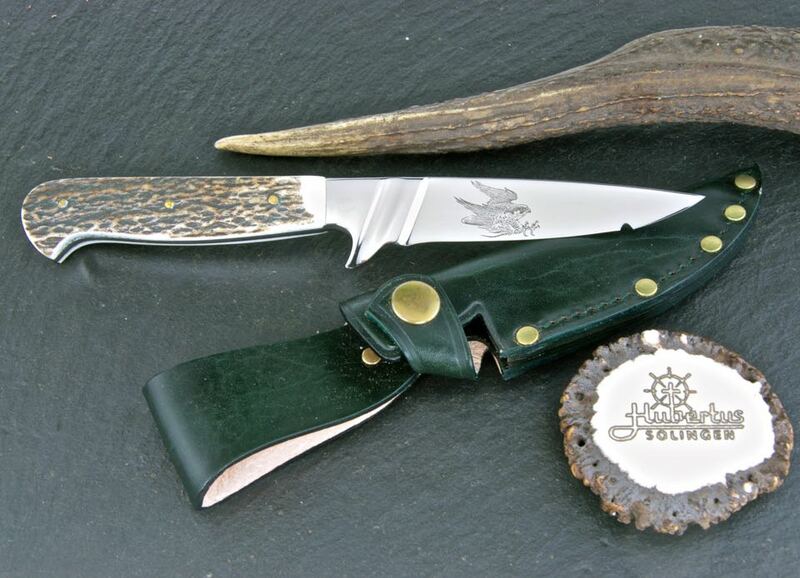 Falconer's knives are special fixed bladed knives used for hunting with birds of prey. 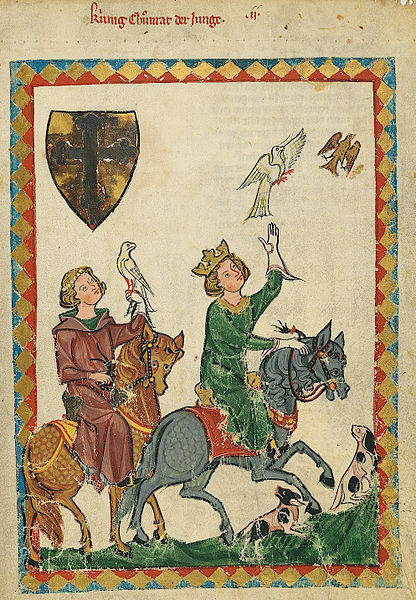 As the bird brings the living prey animal to its falconer, the animal has to be killed by him/her. The special grinding of the blade allows prevents that the claw of the bird is injured: only the first part of the blade is sharp on a length of 2-3 cm / 0.79-1.18" while the rest of the blade is blunt in the direction of the handle. The transition between the sharp tip of the blade and the blunt part of the blade can be recognised by an arched indentation. 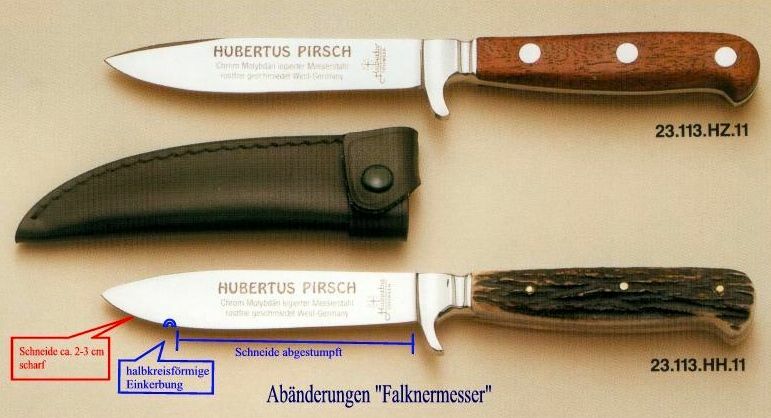 HUBERTUS Falconer's Knives are normally decorated with the illustration of a bird of prey by an electrolytic edging of the blade. 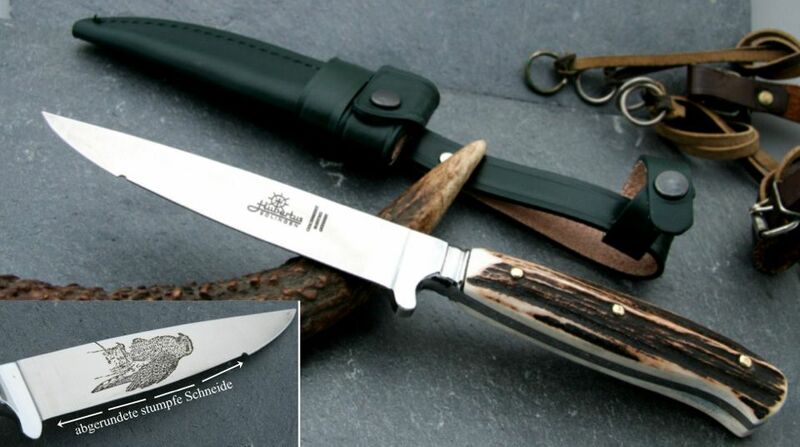 Overall length: 23 cm / 9.06"
with Blade Etching "hunting Falcon"
Blade length: 9.5 cm / 3.74"
Blade thickness: 5.1 mm / 0.20"
Overall length: 22.5 cm / 8.86"
Blade thickness: ca. 3.5 mm / 0.14"
Overall length: 22 cm / 8.66"